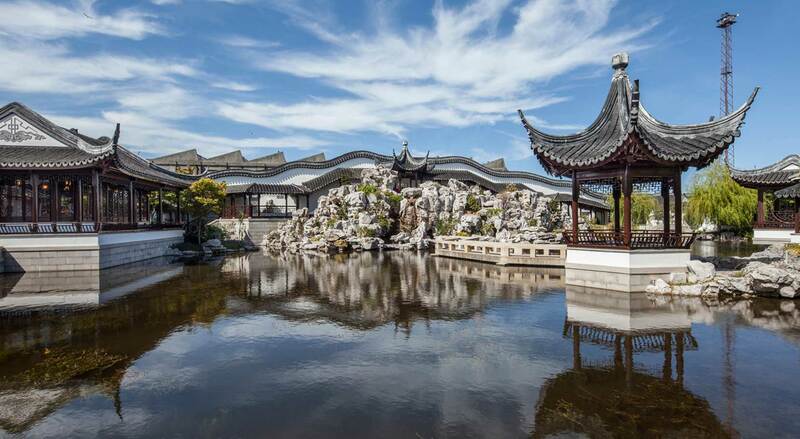 "The Dunedin Chinese Garden is a gift to the city for all New Zealand, honouring the past, celebrating the present, and providing enlightenment on our shared path to the future Dunedin Chinese Gardens Trust". The Dunedin Chinese Garden was first proposed at the time of the city's sesqui-centennial celebrations in 1998. As the concept of a garden gained momentum, the Chinese community established the Dunedin Chinese Garden Trust. At that time it was intended to create a fitting, permanent, recognition of the Chinese who first came to Otago during the 1860s Gold Rush and stayed to establish some of the city's businesses. This contribution to business played a large part in making Dunedin New Zealand's leading commercial centre. The Trust succeeded in its goal, overseeing the design of an authentic garden, the fund-raising for the project and the liaison with the Trust's Shanghai partners - the Shanghai Municipal Government and the Shanghai Museum. 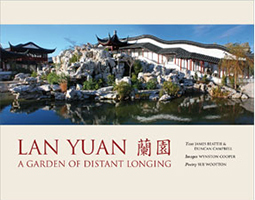 Lan Yuan: A Garden of Distant Longing tells the story of the world’s southern most Chinese garden, a garden that was conceptualised in New Zealand, designed and built in Shanghai, and shipped 13,000 kilometres to Dunedin. Lan Yuan thus connects two histories, traditions and peoples. In following the garden-building principles of 17th century China and acknowledging the history of Otago, this beautiful garden both evokes the memory of the Chinese gold miners who reached New Zealand in the 1860s and confidently looks forward to the strengthening of the New Zealand-China relationship. 112 pages in full colour, more than 130 photographs and illustrations. This book, written by James Beattie, uncovers the rich intellectual, cultural and architectural heritage of Dunedin's elegant Chinese Garden. It explores past and contemporary inspirations for Lan Yuan, including the historical relationship of Otago's Chinese and European settlers with Chinese gardens and plants, the design features of Lan Yuan and its development and meaning. The book costs $9.50 and all funds raised go to the Dunedin Chinese Garden Trust for their fundraising support of the Dunedin Chinese Garden.